Promising Strategies: Do you believe your strategic planning process delivers maximized potential? The intent of strategic planning season is to introduce new and promising ideas in order to solidify a strategy that will be executed to draw out a desired goal. As exciting as it should be, how many dread the long planning sessions, the dissecting of fresh processes and the exhausting planning? How many have experienced a stagnation of fresh ideas and feel as if a strategy session is more of a place where great ideas go to get extinguished versus accepted and welcomed? Interesting data collected from over 300 companies suggest that strategic planning time brings out a dichotomy of emotions: excitement for valid strategic ideas and also dread from the assumption of the rejection of such ideas. Further data from those previously surveyed companies suggest that less than 30% of business executives believe their strategic planning efforts are truly delivering maximized potential. If over 70% of the business world’s decision makers are confident in their work as corporate strategists, what is missing? What happens that causes a dilution in strategic objectives? In many large corporations, this is a common issue. One of the underlying causes of this is simply: the absence of solid support systems spread throughout the organization. Of course many people have different ideologies when it comes to the concept of strategy, but the fact remains that the results are always the same: implementation which leads to desired results. In our consultancy, we advise companies to take a moment to evaluate a different approach to their strategic initiatives. We advise them to take the paradigm to a higher level of expectation. We guide them in acknowledging the value in targeted debates, strategic decision making, and exploration on how to engage multiple components of the organization. We do not approach every business of every industry the same, all businesses are unique and have different needs, however we take a 3-dimensional stance as step one in top quality, value excavating strategic planning. 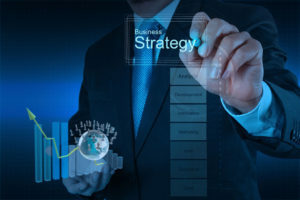 Common structure of the strategic planning development is having data and planning analysts demonstrate the agenda while the decision makers are the executives who discuss the alternatives. These decisions guide the strategic implementation of the next few business quarters, usually not by the decision makers but by the company’s workers. There is a separation in-between these two dynamics of the company and sometimes causes a non-consideration of raw customer input or problematic data analysis. Neglecting to emphasize the customer’s voice is a large part of the anatomy of a problematic strategy which will be difficult to implement. How does one leverage the time on healthy, productive debate on strategy? By identifying what is important on a management level versus identifying what can be resolved by talented and capable financial and operational staff. A change of thinking within the corporate structure may have to take place in order to empower existing business units to pinpoint what they can own before engaging upper management. Executive level leadership cannot sacrifice time towards owning decisions which steer them away from what really matters towards the overall business objective. This seems rather obvious, but does happen very often. No matter what background leadership is from, they must have the essential skill to identify what they really need to own and decide, letting this take precedence above all. Keeping these two elements separate in the planning process will improve the quality of implementation and execution greatly. Having too much emphasis placed on budgets tends to result in math analysis and the measurement of basic incremental changes. You do not want miss the value of leadership teams engaging in provoking debates about what they aim to deliver. Topics about customers and how to stay relevant in a challenging market is a strong strategic way to improve business dynamics. The most successful strategists know how and when to link budgets and strategy, and then utilizing a cross-functional, operational team to implement. Savings, budget and financial targets should always be part of the results of any initiative, not the force that drive the aspirations.